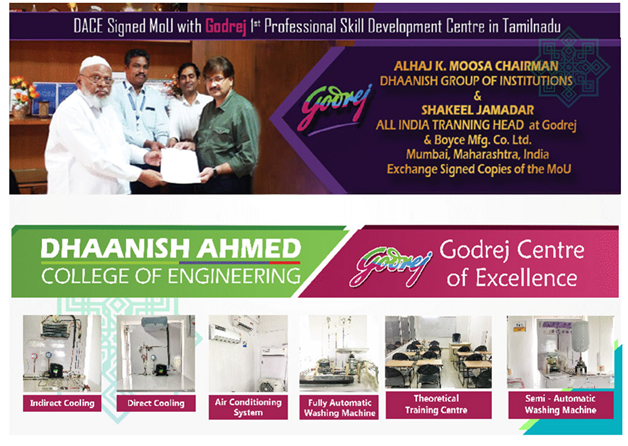 With an aim to equip youths in the suburban and rural areas, with skills which will enhance their employability / generate self employment, DACE join hands with Godrej & Boyce, in setting up a skill development centre, to impart training in “ Servicing of Home appliances – Refrigerators, Air conditioners, Washing Machine, Microwave Oven, etc”. In 2010 Godrej Group decided to adopt an overarching CSR and sustainability strategy called ‘Good and Green.’ In this frame of reference the ‘Good’ refers to the activities that Godrej will undertake to identify and satisfy the needs of the population which has been underserved, hither to. The ‘Green’ refers to the activities that will conserve and foster greener India. It is through the adaptation of this framework that the Godrej Group will strive to create systematically shared value whereby it will engage in policies and practices that will enhance the competitiveness of the company while simultaneously advancing economic and social conditions in the communities in which it operates. Godrej Group, as a part of Godrej Disha (Ensuring Employability) has ambitious plans of training 1 million rural and urban youth in skilled employment by 2020. Godrej & Boyce, a holding company of Godrej Group has a sizable share to train. Students with educational qualification of 8th standard, 10th standard, 12th standard, ITI and Diploma can choose appropriate course and enhance their employability skill / aim for self employment. This is a unique and rare initiative and the courses are offered at nominal fees. On completion of the courses, certificates will be issued by DACE in association with Godrej Disha. You are requested to kindly disseminate the information about the courses to all your students and alumni to enable them to derive maximum benefit from the same.